SANTA CATARINA PINULA, Guatemala -- Emergency crews dug through tons of earth Sunday in an increasingly hopeless attempt to find anyone alive in the acres of mud that buried a neighborhood in a Guatemala City suburb and claimed at least 83 lives. 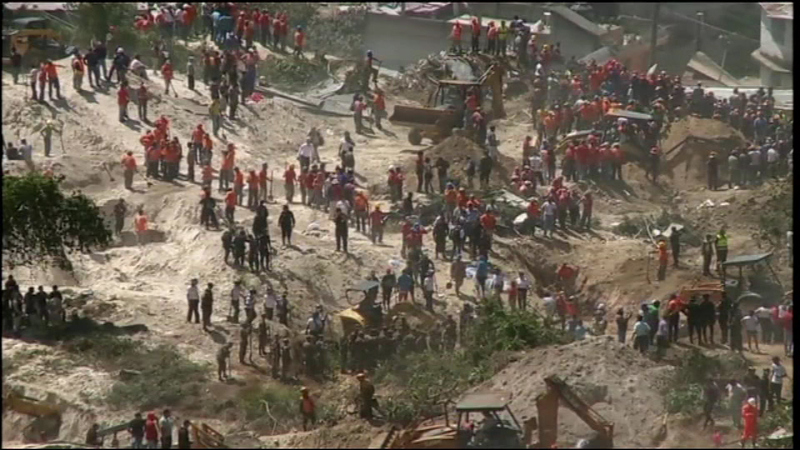 Rescuers using backhoes, shovels and pickaxes attacked the massive wall of earth and mud where as many as 350 people were believed to be missing. As time went on, hope of finding survivors dwindled. "Only a miracle can save them," rescue worker Ines de Leon said. The mudslide that came off a collapsed hillside late Thursday buried the Cambray neighborhood in Santa Catarina Pinula, a middle-class community of government workers, salesmen, taxi drivers and cooks. For the family of Manuel Sandoval and Maritza Aquino, it stopped everyday life mid-text, mid-sentence, mid-dream. Their daughter-in-law, Tanya Garcia, had made her regular evening call to her mother to check how her blood pressure was. Granddaughter Melany Sandoval was texting a friend in another state in Guatemala. Suddenly the conversation stopped. In all, seven members of the extended family are dead and four missing from the canyon home that Manuel Sandoval built 16 years ago, where he, wife Maritza, three sons and their families lived. Pablo Sandoval, the only surviving brother, was at work when the slide hit and said he heard from a friend that there had been some kind of tragedy in his neighborhood. When he arrived home, he saw "nothing but dirt." It was his job to identify and retrieve the bodies. A large man, he handed out bear hugs and shared tears with scores of mourners at the wake in an open-air courtyard on the town square. "We were a family of workers, fighters, from my parents down to the youngest," he said. "Very caring. The best." Municipal authorities said that they thought the number of missing was closer to 300 because some people had not been in the 125 buried homes when the mudslide struck late Thursday. While some families prepared to bury their dead Sunday, dozens more continued to wait outside a makeshift morgue as more bodies were brought in, hoping to find their loved ones. One woman, Sandra Escobar, said her mother was inside viewing bodies in search of family members, including aunts, uncles, cousins and nephews. In all, she said, there were 20 relatives they had not heard from since the mudslide. By Saturday night, residents were out in the town square in front of the looming white church with powder-blue cupulas, where many of the Masses for the dead would be held. The central kiosk with the red tile roof was piled high with donated milk, juice boxes, clothing, toilet paper and rice. People cried in the square and at the Sandoval wake, where volunteers cooked large pots of rice, beans and chicken and homemade tortillas. The extended Sandoval family first learned of the mudslide via a relative's posting on Facebook. "Tell your relatives, there's been an accident," the posting said, according to Alma Salic, Tanya Garcia's mother. Many drove all night from around Guatemala, some from San Marcos state and others from Peten. Eduardo Perez, 17, who came to pay his respects, was uphill from the Sandoval home making dinner when the hillside fell. He and others ran with sticks to try to rescue the trapped, climbing onto to broken roofs to pull people out. In one house, he pulled out a 17-year-old, two younger children and their mother. A fourth child, a 15-year-old sister, was buried, Perez said. "You could only see her arm and nothing else." The photographs on the caskets at the Sandoval wake showed their everyday lives cut short. Sandoval held government jobs, and Aquino worked in a school for the blind. She was getting ready to retire. Son Jose Sandoval, known as "Johnny," sold cellphone accessories and loved the Zacapa Gallos soccer team. "My son-in-law and my grandson loved playing soccer together," Salic said. "He was good son-in-law. He took good care of my daughter, of his family." Her grandson, Bryan Sandoval, 17, was pictured with a giant trophy from a band competition. He was a drummer. Older sister Melany, 19, had finished high school and was thinking about work and studying law. "We were always together. We went on vacation as kids to my grandmother's hours in Zacapa," said cousin Karla Pirir Sandoval, 27. She broke into tears thinking of all the holidays past. "Every Christmas they came for dinner with us."